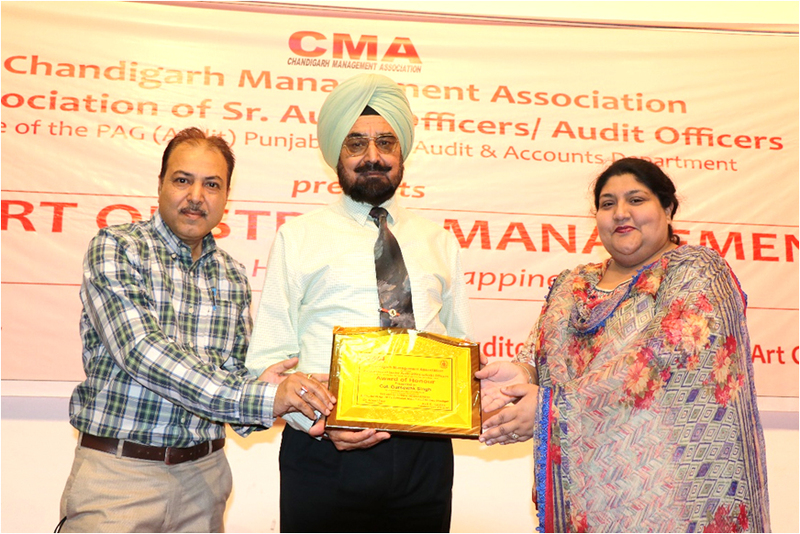 Chandigarh Management Association and Association of Sr. Audit Officers/Audit Officers O/o the Principal Accountant General (Audit) Punjab organised a session on “The Art of Stress Management for health and Happiness” in Auditorium of Museum & Art Gallery, Sector 10 Chandigarh on 9 April 2017. Colonel Gursewak Singh, The Stress Management Guru of world fame shared his deep knowledge and enlightened the audience to remain happy, healthy and wealthy. The session was full of enthusiasm and valuable knowledge. The elite audience felt benefitted with the therapy on stress control. Shri Deepak Dhingra, Secretary General of CMA and Executive Member of the Officers Association organised and very well compered the session. A large number of officers and members of CMA attended the session and applauded the techniques of stress management.